If you’re looking for an easy appetizer for the grill, make this recipe for easy grilled mushrooms. Super easy and super delicious. Chicago has been having a rainy week. Mr. B. has been eying the grill all week; he couldn’t wait any longer for it to get nice out and decided to grill. He is obsessed with grilling in questionable weather – the only real measurable snow storm here this year saw him out with his spatula, tongs and parka grilling up burgers. Rain storms are considered “perfect grilling weather” by him. We did our usual whatever burgers – literally whatever ingredients sound good to me for the evening get thrown into whatever ground meat I can find in the freezer. 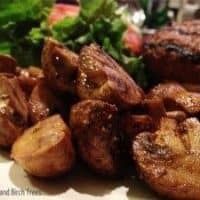 The perfect side dish to my burgers was this very easy grilled mushroom recipe. You will need a tin pan – I think they’re called roasting pans and you can get them at most grocery stores in the same aisle as the plastic bags/foil/plastic wrap. You will also need tin foil, and a spoon. And that’s about it for tools. A side note: I referenced EVOO in my ingredient list, and for the uninformed that stands for extra virgin olive oil. I have since changed it but I still wanted to mention it because for months I read Every Day with Rachel Ray magazine recipes that also referenced it. I really thought she was using some weird new ingredient I had never heard of in almost ALL of her recipes. I can be dumb sometimes. If you made the same mistake, know you’re not alone. Heat grill to 500 degrees. 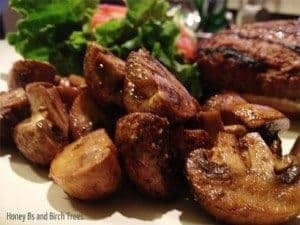 Place mushrooms in grill pan. Add balsamic vinegar, extra virgin olive oil, garlic salt and black pepper to mushrooms. Toss so everything is evenly coated. Sprinkle cayenne pepper over mushrooms. Grill for 20-25 minutes depending on how soft you want the mushrooms to be. Toss again before serving. Any recipe that only has five steps is definitely one I would consider easy. You could easily add other vegetables to the pan (ie asparagus, eggplant, squash) – just adjust the other ingredients accordingly.